Alu wadi or Paatvad are an all important feature of a Pathare Prabhu Shravani Somwar meal. 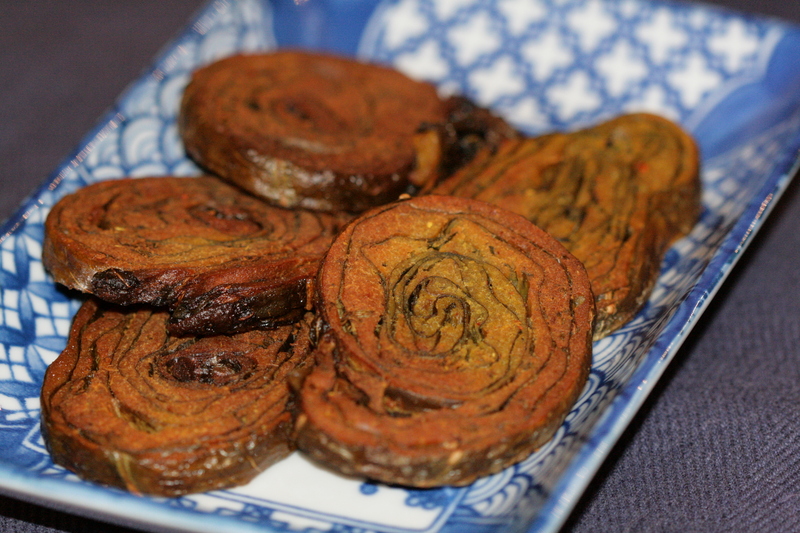 These are made from the leaves of the colocasia plant also know as ‘alu’ in Marathi. Alu wadi or Paatvad are similar to a Gujarati dish called Patra. The main differences between the Maharashtrian and Gujarati versions can be attributed to the spices or garnish used and the fact that the Maharashtrian ‘paatvad’ are deep fried while the Gujarati ‘patra’ are steamed. The recipe can be easily multiplied. This version yields 15-18 pieces. 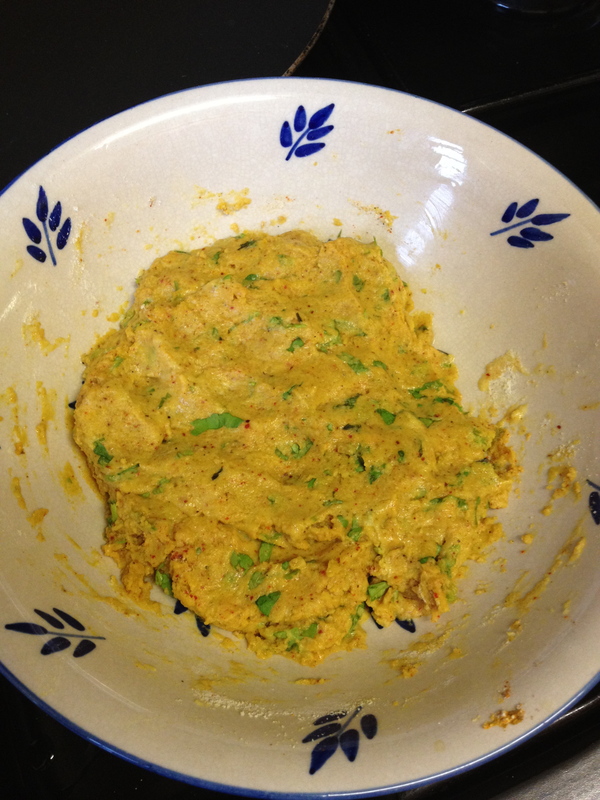 Mix the chickpea flour, semolina and all the spices and salt. Add the chopped coriander leaves. Add a little water to mix it all together so that you get the consistency of a soft dough. Keep aside. Divide this mixture into balls equalling the number of leaves you have. Wash the alu leaves well. Trim the stems away so that the leaves can lie flat on the table. Brush a little of the tamarind water on to the leaves. Keep aside. 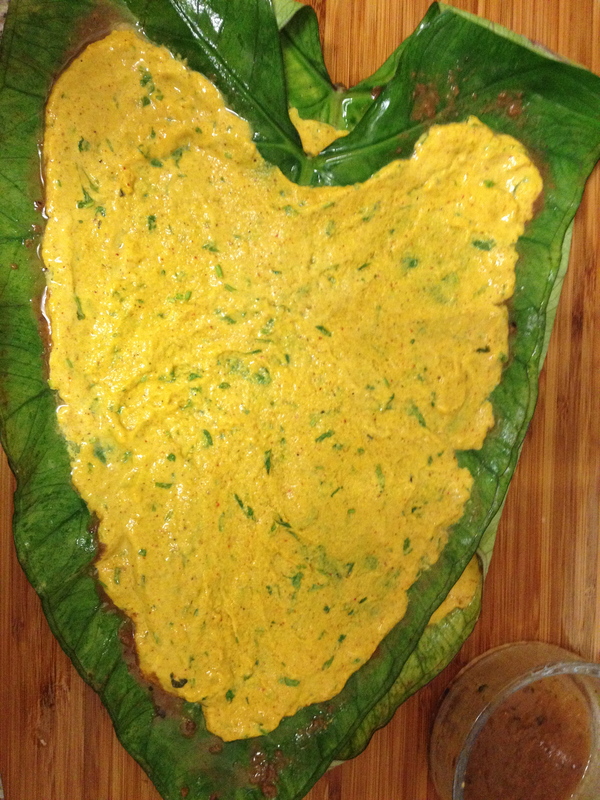 Lay one of the alu leaves on your prep table or platter. Take one of the balls of the chickpea mixture and spread it evenly across the leaf making sure that it goes right up to the edge. Use a little water, if required, to spread it easily. Lay the next alu leaf over this one and cover with the chickpea mixture, as before. Continue this process of layering until you have used up all but one of the leaves. 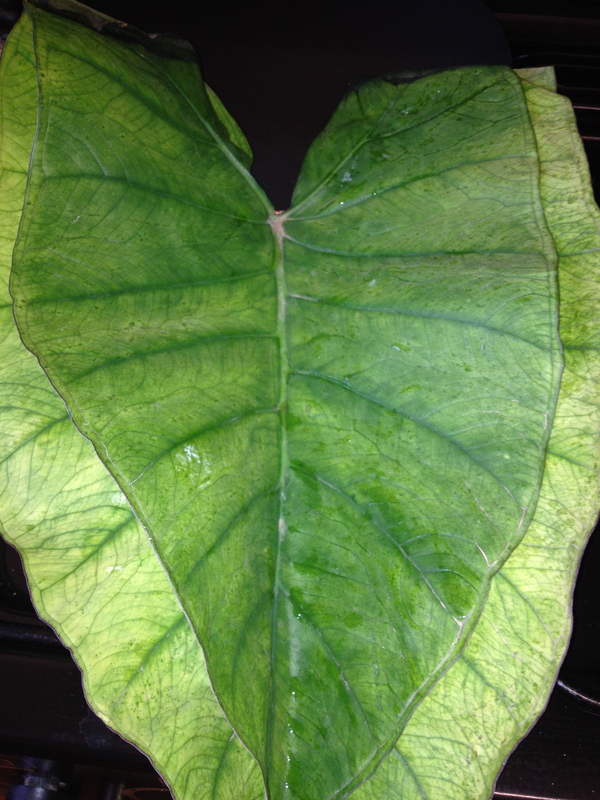 The final leaf will not have any of the mixture on it. Place a chopping board or a weight on this stack of leaves and keep aside for 10-12 minutes. 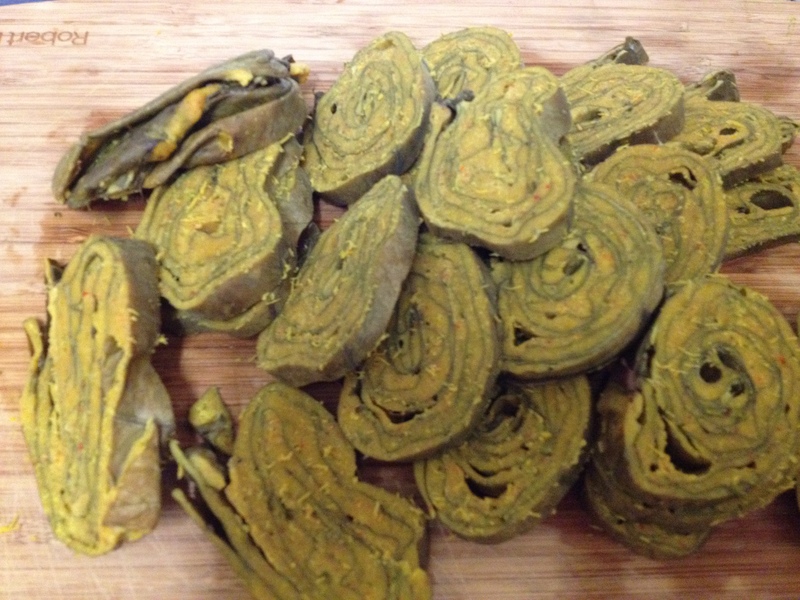 Roll up the stack of alu leaves as you would a swiss roll, ensuring that this is quite a tight roll. A loosely rolled version will not hold together well. Steam the roll for about 5 minutes until the chick pea paste is cooked. Slice and fry in a pan of hot oil. Traditionally, these would be deep fried but I find that the shallow fried versions taste just as good. Best served hot with steaming varan-bhaat. – I’ve simplified the method by focusing on the different stages of preparation. – Prepping the filling should take you under 5 minutes as will the preparation of the alu leaves. Assembling the paatvad should take about 10 minutes, plus 5-7 minutes for steaming. Up to this point you can make the dish a day in advance. – *Sambhar masala is a powder masala native to the Pathare Prabhu community. If you don’t have access to this masala, you could substitute it with cumin-coriander powder. However, the taste will differ from the original version. This entry was posted in Festive food and tagged alu wadi, chickpea flour, colocassia, epicurious, paatvad, patra, savoury Indian snacks. Bookmark the permalink.